– The stylish white design hugs the wall and blends with your bathroom surroundings. – An easy way to store bath toys for your baby. – Can also be used to store soaps, shampoos etc. – Provides ventilation from all sides, which helps the drying process. 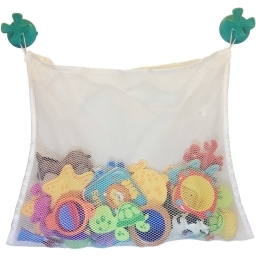 – The mesh bag is durable and washable. – The suction cups are super cute and stronger than any other toy organizer available in the market. – Suction cups can hold up to 20 pounds when used on smooth tiles, glass surfaces or any other perfectly flat areas. Here is how the #BubbleBaby toy organizer arrives. I wanted this product for my young boys, so that they can clean up after themselves at bath-time. They can now easily access their toys and just as easily put them back away to hang and dry when they are done. I am all for delegating duties to take some of responsibilities off of me and putting them back on the children. They need responsibilities and they need to learn how to do things for themselves and I need them to do some things themselves. 🙂 Here is what’s in the bag. See the white part sticking out of the green suction cups that is the specially designed spring features that makes them so strong and the clear suction cups attached to the mesh bag. This product actually includes four suction cups. There are two attached to the loop of string on the mesh bag and the green ones that are designed and engineered with a small spring to increase the holding strength. They can hold up to 20 pounds! I cleaned my tub and add a thin layer of Vaseline to the backside of the green suction cups and pushed them into place and then hung the mesh bag up and pressed those suction cups into place as well. I let it sit for a little bit and then went back and filled it with all their toys. The mesh bag is really big so it holds a lot plus its easier for the kids to get toys into and out of. Another HUGE plus for the mesh bag is that it is mildew resistant and with the way it’s designed the air flow really helps the toys dry quicker. It is really durable and if it does get dirty it is completely washable as well! Some people have also used this to hold their shower supplies like shampoo, conditioner and body wash. This product can be purchased on Amazon, http://www.amazon.com/dp/b00v3kwgg2, for $14.95 as of today.